This time last year I'd just had my cast off, and I was worried what people would make of my altered appearance. A year on, I can't quite believe what I've experienced. It sounds like a cliche, but 2016 has been a real humdinger. It turns out my surgery merely represented the beginning of alterations in my life. Friendships, relationships, family, work, health... so much has changed. And the same can be said for the world. What. a. year. Mental health is not an upwards gradient. Your expectations towards your career, relationships, family etc, are your own. If someone else thinks you're being unrealistic, aiming too high (or too low), they can buzz off. Saying 'yes' can open doors you didn't know were even yours to be opened. A duvet day can be as good as a holiday. It's okay to give yourself a break and do something silly or frivolous. The only regrets you should have are hurting those you care about. Wonderful, amazing people die. It's important to be aware of your own mortality, and to appreciate the little things in life. A blow dry will make you feel like the sassiest gal in town. If something is keeping you awake at night, night after night, it means something. The first thing you think about when you wake up in the morning is extremely significant. Physical intimacy should not be confused with actual intimacy. A year without a summer holiday makes for a bleak year. If you don't change something that's bothering you, you're the fool. Seeing Justin Bieber live will probably be better than your wedding day. Belieber for life. Kissing men more than twice your age probably won't end well. You're not ugly, the lighting is just bad. Flowers can make the gloomiest day a bit brighter. In a relationship you are either a dog, or a cat. I am a dog. I need to be a cat. Sometimes, despite your best efforts, things just don't work out. C'est la vie. You can't expect people to reach out to you if you don't reach out to them. Overdrafts are a blessing, but savings are a joy. Sometimes you think you're sad but all you need is a hug and a glass of wine. And if everything goes wrong, at least it'll make for a good story... right? A lot about dating. 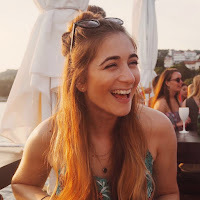 Why I struggle with dating apps; my experience of scientific speed dating (yep, it's a thing) with an interview with the clever lady behind it; and what goes down at a Love Surgery. Why exactly I decided to undergo surgery in my rhinoplasty Q&A. You're a nosey (sorry, couldn't resist) lot. That I may have found my favourite pizza in London - if not the world - and indulged my crazy cat lady self at a Hello Kitty Afternoon Tea. How to pretend you're having fun in the sun... in the UK. That any self-respecting make up lover needs to get their hands on this gorgeous make up brush collection - it's the dreeeam. Venues with multiple uses are the best thing ever. Confused? Don't be.